The White Lion is located in the centre of the High Street of Thornbury in South Gloucestershire. From a research point of view, the property that is now “The White Lion” was not located in the Borough of Thornbury and we had to trawl the records of the Tything of Kington in the Parish of Thornbury. Surprisingly, as you will read below, in spite of not being in the Borough, the owner still had to pay the Borough Rent. Unfortunately we haven’t seen the deeds of the property so our knowledge is based on documents related to adjoining properties supplemented with our normal sources of census and other records. We believe that it has been a pub since the 1830s or thereabouts. The records of the late 1850s and early 1860s show that the name of the pub at that time was ‘The Lion’ and that in the later 1860s the pub was renamed ‘The White Lion’. The earliest reference we have found to the pub being called The White Lion was in a trade directory of 1868. We had always assumed that the change of name was to differentiate the pub from the ‘The Black Lion’ in Castle Street. However it may be co-incidence but we note that the publican and owner of the property during the 1860s was John White so it is possible that John added his surname to the name of the pub. There are various stories about the White Lion which stands on the porch over the door and which has been a landmark in the town for so long. We have heard that celebration speeches from the winning candidate in elections were made from astride the Lion and that on at least one occasion notably in World War II (when the Maritime Regiment was stationed in the town) the Lion mysteriously changed places with the Swan opposite during the night. We are fortunate that in 1894, the landlord and owner of the White Lion, Josiah Hall, was involved in a court action with regard to unpaid Borough Rent due to Stafford Howard of Thornbury Castle. We have given more details below when writing about Josiah Hall, but the case is important as it tells us that according to the Court Rent Rolls from 1671 to 1681 Josiah’s house was then owned by Alice Hopkins. The 1670 Borough Rent Roll shows that the house owned by Alice Hopkins, a widow, was let to Ms. Wysses at a rent of 6d. Alice also appears in the 1671 Hearth Tax records which show she had 4 hearths in her building. There is a will of Alice Hopkins in Gloucester Records Office which was proved in 1680. In her last will and testament dated 13th December 1680 Alice arranged for five pounds to be paid by her executors out of the rent of the house to her daughter, Elizabeth, and she made other bequests of money and her household goods to her daughter, Joane Croome to her six children and to other grandchildren. There is no reference as to what should happen to the house so we assume that this was covered by an earlier arrangement, possibly the will of her husband. The Bartons – there is nothing about the Bartons mentioned in the documents relating to the property, nor to the adjoining properties. However we have references in other documents which suggests there might be a connection. The last will and testament of John Barton dated 31st March 1687 shows he left his brother Thomas Barton and his brother in law, Robert Thurston, ‘all those my two messuages or tenements lying near to the said Burrough on one whereof I do now inhabit and in the other whereof Susanna Wysse widow deceased and Thomas Mabbett lately dwelt together with the close garden orchard backside stables barns ..and appurtenances to the last mentioned messuages or either of them belonging or appertaining or reputed as part thereof . Together also with all other my freehold messuages closes lands and premises lying in Kington and Oldbury. …………………‘. We assume that the property occupied by Susannah Wysse may be the same property as owned by Alice Hopkins above. We are not sure what happened to the property after John Barton died, but we note another Barton connection later. The last will and testament of Thomas Barton a butcher dated 1st November 1770 says ‘Whereas I, with Sarah my wife, lately surrendered into the hands of the then Lord of this said Manor To the uses of my Will the Reversion or Remainder Expectant after the death of Ursula Cotten of the City of Bristol, widow and relict of Henry Cotten, late of the same City, Papermaker deceased, of and in a customary messuage or tenement wherein I now dwell with several closes of ground, orchard lands, and premises situate in the Tything of Kington within the said Parish and Manor of Thornbury. Now I do hereby give and devise the said Reversion or Remainder Expectant as aforesaid of and in the said messuage or tenement and all and singular the several closes of ground, orchards, lands and premises which I and my said wife have surrendered as aforesaid and also all other the Copyhold or Customary Closes, lands, tenements and hereditaments situate within the said Manor over which I have by my last Will and Testament or Disposing power, unto my good and trusty friend Thomas Cox of Kington aforesaid Yeoman’. Thomas instructed his trustee to sell his property and divide the profits between his children. We are not sure that this refers to the same property, but if it does, it raises the question of how Thomas was related to Ursula Cotten (whose ownership of the property is described below). It might be explained by the connections between the Barton family and the Thurston family as Ursula was the daughter of John and Ursula Thurston or might be explained by a connection between Thomas’s wife Sarah, the daughter of Richard and Ann Giles of Kington) and Ursula’s first husband, William Giles. Ursula Cotten – an indenture of lease and release dated 7th and 8th April 1820 found in the deeds of the adjoining property (Park House) mentions that Ursula Cotten had previously lived in the property we now know as The White Lion. Ursula is listed in the Kington Land Tax records from 1780 to 1784 as liable for a tax of 8 shillings. Ursula was baptised in Oldbury on 30th January 1721. She was the daughter of John Thurston and his wife, Ursula (nee Parnell) who were ‘of Kington’. In his will dated 1739, Ursula’s father left her ‘all the furniture in the best chamber and all the linen and silks in the chest of drawers in that chamber, one silver tankard marked ‘U T Junior’, one silver porringer, eight silver spoons and two silver salts’. Ursula Thurston’s first marriage was to William Giles whom she married in Thornbury on 2nd July 1741. We know from a court roll dated 14th February 1742 that William and Ursula surrendered three closes of land in Kington called Moor Leaze, Lower Foxes and Woodcock Hill to John Thurston. William must have died because on 27th December 1747 Ursula was described as a widow when she married Henry Cotten, a paper merchant from Bristol. That marriage took place in Thornbury. We are puzzled slightly because both Scribes Alcove and the IGI quote the parish record and say that Ursula’s husband was called William Cotten. Other sources including a memorial to two of their children and one grandchild in St Mary Church clearly says that they were descended from Henry and Ursula Cotten. Ursula and Henry (or William) Cotten had two sons, Henry born about 1748 and George born about 1761, and at least two daughters, Amelia and Lydia. Henry snr died about 1769. His last will was dated 29th July 1766. He arranged for £1000 to be put into trust and the income used to support his wife. He mentions two sons, William and Benjamin, whom we suspect were from a previous marriage. There was a Benjamin Cotten baptised on 22nd May 1741 at St Nicholas Church, Bristol. He was the son of Henry and Elizabeth Cotten. The will mentions that William had already been advanced £100 to enable him to set up in business and Benjamin and been advanced £400. Henry jnr was to be given the opportunity of taking over the paper making business and his father’s house if he desired although he had to pay a fair price set by the trustees. Henry jnr (late of Bristol) died aged 27 on 10th September 1775. His brother, George, died at Whitebrooke aged 17 on 24th May 1778. Amelia, died and was buried on 11th September 1782. In her last will and testament dated 15th August 1780 she was described as a spinster living in the Parish of Thornbury. Amelia left her personal estate to her mother during her lifetime and then to her sister, Lydia. Lydia married Neville Bath in 1771 in St Mary Redcliffe Church, Bristol. It is possible that there may have been a third daughter as a Mary Cotten married Benjamin Davies in Thornbury on 19th July 1781 and Lydia Bath was one of the witnesses. Mary is not mentioned in Ursula’s will. Ursula died and was buried on 2nd January 1789. Her last will and testament was dated 3rd February 1787 and proved on 17th July 1789. She left the house where she was living (which we assume to be the Vine House as it was still being described as ‘in or near the Town of Thornbury’) to her daughter, Lydia, during her life time and after her death it was left to Lydia’s daughter, Ursula Maria Bath. Ursula also left £700 of money in the hands of her nephew, Kingsmill Grove and secured by his bond to Neville Bath in trust for him to pay out various financial bequests. Four shillings each week should be paid to Ursula’s brother, Samuel Thurston subject to him signing for the receipt of such sums each week. The rest would be used for the education and maintenance of Ursula’s grand-daughter, Ursula Maria Bath until she reaches the age of 21 and then she would be left the whole of the principal sum and interest. Ursula also left five guineas each to her brothers, John and Edward and to her sister in law, Alice Vaughan. Lydia Bath – after Ursula Cotten’s death in 1789 the property descended to her daughter, Lydia. She had married Neville Bath in St Mary Redcliffe Church, Bristol in 1771. They had a daughter, Ursula Maria Bath, born on 20th August 1772 and baptised in Thornbury on 16th September 1772. The baptism record shows her father, Neville, was a cutler and that the family were then living in Bristol. Another daughter, Margaret, died aged 3 months on 1st September 1775. Neville Bath died and was buried in Clifton on 20th March 1802. We don’t know what happened to Lydia, but in accordance with her mother’s will, the property eventually descended to her daughter, Ursula Maria. Ursula Maria Bath – on 20th April 1802 Ursula Maria married Winchcombe Hartley Willis in Foxley, Wiltshire. Winchcombe was the son of Henry Willis and his wife, Jane (nee Lubbock) and brother to Temperance Jane Willis and Louisa Laver both of whom had connections with Thornbury. Winchcombe’s family led a colourful life. Winchcombe himself was no exception. We are grateful to Eric Lubbock (now Lord Avebury) for allowing us to share some of the family story. He found that Winchcombe was supposed to take ship as mate in May 1794 but missed the boat, running up bills for coffee houses, a hairdresser, breeches maker and hire of coach in the process. Mr S Howard of Southampton Street, London, in whose care the wayward youth had evidently been placed, excused himself to Winchcombe’s father, saying that he had ‘discourag’d all extravagance and had him with me as much as my engagements would admit of’. Mr Howard wrote plaintively: ‘how the mistake of letting the ship go without him happen’d I can’t imagine’. Winchcombe had been expensively kitted out for his career at sea. A letter from John Bulman dated June 16 1794, says: ‘I am informed by Mr Howard of Southampton Street to whom I have made application that you have given him Orders not to discharge at present my small Bill delivered some time ago amounting to £(illegible) for Cloths made up for your Son before his departure from England – and the reason he assigns for this unexpected delay of Payment is you think too high a Charge has been made – in this particular I am confident no Man in London would have been more reasonable considering the very expensive manner and the number of Buttons &c – they were made up with and at the request of your Son every thing is stated at the very lowest price for present money, which he informed me would be the Case, and that Mr Howard had full directions to discharge those small matters. I should esteem it a particular favour if you would now give that Gentleman leave to settle – with me as I have several very pressing decisions which require all the money I can possibly raise and a Line for that purpose will much oblige‘. The ‘small Bill’ for uniforms apparently came to £11-8-6. Eric noted that Mr Bulman would have been lucky to get paid, for less than three weeks after the date of this appeal, Winchcombe’s father, Henry Willis, died on July 4 1794. Evidently Winchcombe did finally put to sea. As an Ensign of His Majesty’s sloop ‘Osprey’, he captured a French privateer Le Diable in the West Indies. Unfortunately Winchcombe died there shortly afterwards in 1803, suffering from a fever. It was only a a few months after his marriage with Ursula Maria. Letters held by Gloucester Records Office show a representative of the English inhabitants of St Lucia described their admiration of Ensign Willis who had apparently attacked the French privateer with a handful of soldiers and forced them to surrender. The prize was a valuable one as the sloop was auctioned and fetched (together with the provisions on board £146 2s, of which £142 10s was paid to Ursula. (By 2010, £142 0s 0d from 1804 was worth £122,000.00 using average earnings). The documents show that Ursula shared her reward with members of her husband’s crew, although it is not clear how much she gave away. Ursula was also given a plate bought by a collection from the grateful inhabitants of the island who had been subject to “annoyance” from the privateer. We note that Winchcombe was honoured by the family of Joseph and Louisa Laver when they named a son ‘Winchcombe Willis Laver’ born in 1804. We know that Ursula Maria re-married as she is noted as being Ursula Maria “Brooks” (more properly Brookes) in a schedule of documents relating to the property thought to be the White Lion. We have been contacted by Neil and Alison Fagan who tell us that Ursula’s husband was William Matthews Brookes. We have found on the internet that there is a record of the marriage at St. George’s Church, Hanover Square on 2nd August 1813 by licence between “William Matthews Brookes of this parish and Ursula Maria Willis a widow of Slough co. Bucks.” We understand that William was the son of William Philpot Brookes. It seems that William was much younger than Ursula and that the marriage occurred after his return to England from the Peninsular War late in 1809 (aged only 20). William was appointed Surgeon of the 1st Royal Surrey Militia and served with that unit until his death. We do not believe that there were children to this marriage. William was buried in the family vault at Mitcheldean in the Forest of Dean. The National Archives show that probate of William’s will was granted 11th October 1819. The schedule referred to earlier is an indenture of lease and release dated 18th and 19th July 1818, the release between Ursula Maria Brookes of the Town of Ross in the County of Hereford widow of the first part, Joseph Laver of the parish of Thornbury mercer of the 2nd part and George Laver shopkeeper of the third part. We don’t know who was occupying the property during the period from Ursula Cotten dying in 1789 until John Cook the butcher occupied it at some time around 1820. Ursula Maria Brookes ‘widow of Ross in Herefordshire’ died in 1824. She appears to have been buried in St Martins in the Fields in London, although it is noted that her age at death was given as 41 and not 51. Ursula left the bulk of her estate to two of William’s brothers, Samuel Philpot Brookes (surgeon of Ross) and Thomas Brookes (solicitor of Tewkesbury) both of whom had Thornbury connections. She also left small bequests to Temperance Jane Willis, Sophia Willis and Louisa Laver. Temperance and Louisa are definitely Ursula’s sisters-in-law and we assume Sophia is also a sister-in-law although according to information from a family researcher, Eric Avebury, she died young. Later that same year Samuel Philpot Brookes married Sophia Willis in Thornbury and it is assumed that she was the one mentioned in Ursula’s will especially as the witnesses at the wedding were Joseph and Harriet Laver. Sophia and Samuel had a daughter, Jane Temperance in 1827 who seems to have lived most of her life in Thornbury until her death in 1882 (she is mentioned in St Marys monumental inscriptions). As Samuel was accidently drowned in 1829 it seems likely that Sophia and Jane moved to Thornbury to live with relatives. There is another marriage record for Samuel and Sophia a few weeks after the Thornbury ceremony. This took place in a Roman Catholic church in Newport on the Isle of Wight. Perhaps one of them was a Roman Catholic and hence the second ceremony. Thomas Osborne Wetmore – acquired the property from Joseph Laver in 1820. Thomas was a major property owner in the Town. He lived next door at Park House and he made a series of acquisitions of neighbouring property to allow him to expand his garden and the access to and from his house and he appears to have taken a piece of the ‘White Lion’ property into that of Park house. James Prewett – the 1840 Tithe Survey shows James was occupying the property at that time, but he may have been there a lot earlier. The baptism records of his children shows he was a shopkeeper in 1809 and 1811, a coachman in 1814, a carrier in 1815, a coachman again in 1817, an innkeeper in 1820 and a coach proprietor in 1824. The 1830 Pigot Directory shows James was running a ‘Caravan’ to Bristol from Thornbury on Monday, Wednesday, Thursday and Saturday morning. The 1839 Robsons Directory lists James Prewett as a retailer of beer, lets horses, van proprietor etc in the High Street. The 1842 Pigots Directory shows that James was operating a daily van service for passengers and luggage to Bristol. John White – the 1861 census shows John White was the innkeeper. He was aged 65 from Dorset and living with his wife, Julia aged 49 from Bristol and their daughter, Julia aged 13 also born in Bristol. The website of Gloucestershire pubs shows John was licensee there from 1858 to 1861. The 1859 and 1862 Rate Books list John as the tenant of Thomas Osborne Wetmore. There is an advert in the Bristol Mercury on 2nd October 1858 showing that ‘John White of the Lion Inn, Thornbury having just purchased the Prewett omnibus business has determined on disposing of, by private treaty, the original omnibus which for the last 14 years has left the Antelope Inn, Broadmead in Bristol for Thornbury, every morning; together with four horses and the goodwill of the said omnibus and route. Note the above is the only omnibus that leaves Bristol for Thornbury in the morning. For further particulars and to treat for same, apply to John White, Antelope Tavern, Broadmead, Bristol or Lion Inn, Thornbury‘. John and Julia had a daughter, Julia Isabelle, born in Bristol in 1847. The Bristol Mercury of April 17th 1847 announced that John White was the proprietor of “the new coach, the Berkeley Hunt 2, that would leave the Berkeley Arms Hotel four times a week at 8 and the Swan in Thornbury at 9 and would arrive in Bristol at 10.30. There was a return journey from Bristol at 4.30. In Bristol the coach stopped at the Greyhound, the Antelope and the White Horse, all in the Broadmead area. The 1851 census shows the family living at The Antelope in Broadmead, Bristol. John was described as being a coach proprietor aged 55. Julia’s age was given as 49 which is the same age as she was given in the 1861 census. This is a bit puzzling as we think she was born around 1819 and baptised in 1820. The 1868 Directory of Gloucestershire shows John was operating a daily service to Bristol leaving the ‘White Lion’ at Thornbury daily at 8.30am and returning from the Full Moon, North Street, Bristol at 5pm. This shows that John carried on with his coach service, even after moving away from the Thornbury pub. The 1871 census shows John and Julia had moved to 31 Kingsdown Parade and John was running the pub there (which is now called Kingsdown Wine Vaults). John was aged 73 and Julia was aged 53, which matches our understanding of her correct age. They were sharing the premises with their daughter, and her husband, Charles William Craymer, an accountant whom she had married in the Clifton area in 1866. They had two children: Lily aged 3 and Violet aged 2. The Bristol Lost Pubs website notes that John White was licensee at the Kingsdown Wine Vaults from 1871 to 1877. The advertisement shown above was published some time around 1879. It seems that John White might no longer be running the carrier’s trade as Walter Riddle now had a business based at the White Lion – at least between Thornbury and Patchway. The 1881 census shows that Walter Riddle was a 36 year old bus and fly properietor living with his family on the Thornbury Road in Oldbury on Severn. John White must have died before the 1881 census because at that time Julia was shown as a widow living with a cousin, Nassau Senior, a barrister, in Chelsea. Julia carried on living in London, although we can’t trace her in the 1891 census. In 1901 she was boarding in a house at 22 Edbury Street, Knightsbridge. She died on 7th November 1910 at 141 The Mansions, High Street, Kensington. One of her executors was her brother, William Mair Rolph. Julia is mentioned on a memorial board in St Marys Church in Thornbury which lists charitable bequests and donations. Julia is shown as leaving ‘£500, the interest to be applied at the discretion of the Vicar and Churchwardens for the assistance of poor persons living in the Parish of Thornbury being members of the Church of England’. The Halls – the 1871 census shows that James and Hannah Hall and their two of their children (Josiah and Edith) and a nephew, Henry E. O. Hall were living at the White Lion Inn in the High Street. Josiah aged 36, was running the pub. James was shown as the head of the household aged 59 and was referred to as “a retired innkeeper”. The 1876 Rate Book shows James as owner of White Lion. We assume that James had bought it at the sale on 21st December 1868 following the death of Thomas Osborne Wetmore. The Bristol Mercury has an advert printed on 1st April 1876 showing that the White Lion was available to let, with immediate possession. It was described as ‘an established and well accustomed double licensed house where good business is being done. The premises are well situated in the very centre of the market, have a bar and bar parlour, smoking-room, taproom, sitting room, bedrooms, kitchens, cellar, coach-house and stabling. There is a brewhouse, large bowling saloon, large clubroom, Foresters’ and Oddfellows clubs, with nearly 300 members and a good walled garden and yard‘. It is interesting to note that reference to a ‘brewhouse’ suggests that the pub had made its own beer. The mention of the ‘bowling saloon’ is the earliest reference we have found to a skittle alley in Thornbury. By 1880 James had moved away and left Josiah and his wife, Mary Ann (nee Aldrick) at the White Lion. Josiah was involved in a court action in 1894 with regard to unpaid Borough Rent due to Stafford Howard of Thornbury Castle. This rent was a sort of leasehold arrangement whereby residents of the Borough of Thornbury paid a rent to the Lord of the Manor. The argument made by Josiah’s defence council was that Thornbury was not a Borough in the sense defined by law. There was not a wall around the town. The case was decided on the grounds that rents had been paid in Thornbury for so long. Council for the plaintiff showed that Alice Hopkin’s house for which she paid rent as shown by the Court Rent Rolls 1671 to 1681 was now the White Lion belonging to Josiah Hall and rents should continue to be paid. Costs were awarded against the defendants. The Western Daily Press of 19th November 1908 reported on the petty sessions at which the licence of what was then called “The White Lion Inn” was transferred from the late Mrs M A Hall deceased to her son Frederick Josiah Hall. Despite this it seems that both of Mary Ann’s children, Mabel and Frederick Josiah ran the pub jointly until Mabel got married in 1917. The report of Mabel’s marriage in the Gazette of May 26th 1917 says that she married Joseph Edward Roach Young of Mount Pleasant, Rockhampton. The Brownings – the next owner and publican of the White Lion was Grantley Gilbert Browning. He is listed as being in the High Street in 1918 electoral register and the 1921 electoral register shows him at the White Lion Hotel. Grantley Gilbert Browning was born in Fishponds in 1871. He was the son of Edwin Browning and his wife, Sarah (nee Smith) who had been running the Queens Head in Stapleton in 1861 and the Black Horse in Fishponds in 1871 and 1881 censuses. In 1897 Grantley married Elizabeth Ann Freebury in the Bristol area. The 1901 census shows Grantley was the publican at The Golden Lion at Fishponds in Bristol. Grantley and Elizabeth had several children: Sarah May born in Fishponds in 1897, Lilian Emma born on 23rd August 1899, Worthy born in Fishponds on 17th August 1901, Claude (or Claudius as it is shown on FreeBMDs) and Stuart born in 1903. The couple then had twins Leslie Grantley and Violet Elizabeth who were born in Fishponds on 24th December 1908. We don’t know when the Brownings moved to Thornbury, but Grantley is listed in the High Street in the 1918 electoral register. When the Western Daily Press reported on the divorce of Gilbert and Elizabeth Browning on May 22nd 1920 it described him as licensee of the White Lion Hotel in Thornbury. Grantley died on 24th November 1922 aged 52. The obituary in the Gazette mentioned that ‘In his early years he had been a well known and successful athlete on the cinder track and recognised as one of the best authorities on poultry, his speciality being bantams’. The 1927 electoral register lists Claude Stuart and Worthy Browning as living at the White Lion and the 1931 register shows Claude Stuart Browning and Leslie Grantley Browning living there. However, we believe that Grantley’s daughter, Lilian, and her husband Herbert Henry Parsons, took over the running of the White Lion. We don’t know where Elizabeth Ann went to live as she is not listed in the Thornbury electoral registers. She died on 8th May 1947 aged 73. Sarah May (known as May) married Frank Tucker in 1920 in the Wheatenhurst area. She died on 29th February 1956 aged 59 when her surname was Knight. Lilian Emma married Herbert Henry Parsons in Thornbury in 1923. They took over the running of the White Lion following the death of her father. (see below). Worthy married Olive May King on 12th July 1930. He died in 1977 at Weston Super Mare. Leslie Grantley married Norah Thomas of Tockington on 26th March 1932. Leslie and Norah moved to Tockington in 1937 and Leslie died in Tockington in February 1989. Norah died in a nursing home in Kingswood, Wotton Under Edge in November 1995. Violet Elizabeth (Mary) married William Ernest Faint in 1929. She died in Thornbury in 2002. The Parsons – as mentioned above we believe that following the death of Grantley Gilbert Browning in 1922 the pub was taken over by his daughter, Lilian. In 1923 she married Herbert Henry Parsons. The 1926 Prewetts Directory shows Herbert Henry Parsons as the landlord of the White Lion Hotel. Herbert Henry was born on 13th September 1895 and baptised on 3rd November 1895. He was the son of Charles Henry Parsons, a butcher, and his wife, Julia (nee Phillips). During the First World War, Herbert served in the R. G. H. (Royal Gloucestershire Hussars). A reference in the Gazette shows that he was serving as a Trooper in Egypt in 1917. In 1923 the Parsons family were living at 8 High Street when Herbert married ‘the girl next door’, Lilian Emma Browning, the daughter of the landlord of the White Lion, Grantley Gilbert Browning (see above). Herbert and Lily had two children: Grantley Charles born on 6th December 1923 and Dorothy Joan born on 26th October 1933. Both children attended the National School before progressing to the Thornbury Grammar School. In 1953 ‘Joan’ became the Carnival Queen during the Coronation Celebrations. We understand she won the honour to become the Queen as a result of her selling the most tickets in a competition. She used the advantage which she had of selling tickets to the customers in the Lion. In 1929 there were some important changes at The White Lion. The plans shows that a coffee room had been created by dividing the garage, and that hotel had a bar on the left of the porch (which was being re-configured) and a smoke room on the right. Improved toilet arrangements were installed with their own treatment tanks replacing the cesspit arrangement. The building still had a stable with three stalls. The Parsons continued running the White Lion until about 1955. The special register compiled in 1939 in preparation for the war shows Herbert was the publican and describes Lily as doing ‘unpaid domestic duties’. We understand that it was Lily who was mainly responsible for the pub and that during the War she was much admired for her efforts to care for the troops as time the pub’s skittle alley housed soldiers returned from Dunkirk. Herbert died on 7th January 1963 aged 67. Lilian died in 1984. Brian Gay – the next publican at the White Lion was Brian Gay (shown in the photo on the right). Brian moved to Thornbury from Bristol. In 1941 he had married Mary E Bridges and they had two children: Sally V Gay born in 1942 and Robert P Gay born in 1945. 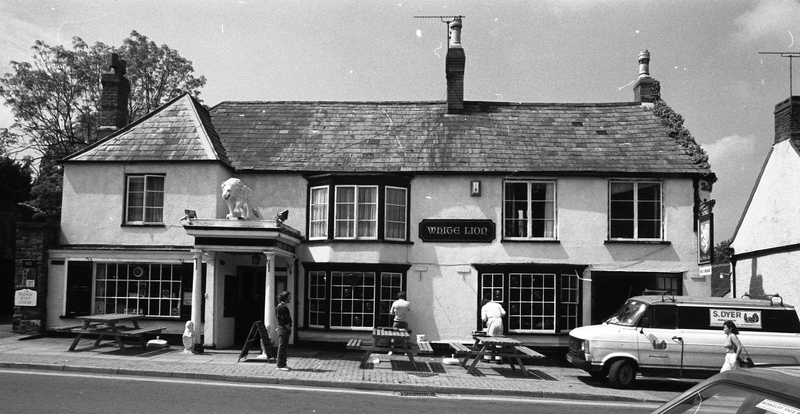 Brian carried on as licensee at the White Lion until about 1977. We don’t know anything about the licensees since 1977. The website of the Gloucestershire Pubs lists the following licensees but we suspect there are several more.